Exeter City boss Paul Tisdale remains the front runner for the vacant MK Dons manager's job after admitting the League 2 play-off final may be his final game for the Grecians. Tisdale has been manager at St James Park for 12 years, but his future at the club has been uncertain since his rolling-contract was ended two years ago by the owners of the club. Dons chairman Pete Winkelman has given himself until the end of May to find a replacement for Dan Micciche after sacking the manager back in April. 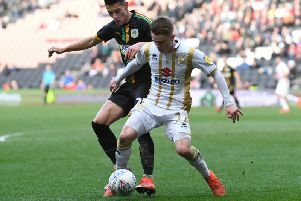 Exeter beat Lincoln City 3-1 at home last week to book their spot in the League 2 play-off final at Wembley, with former Dons loanee Ryan Harley on the scoresheet, but speaking after the game, Tisdale admitted his future was unclear. He said: "Who knows. A lot of managers, coaches and players who get to the end of the season and don't know their future - I'm one of them. Never say never, but I have one more game and I'm fully focused on that as Exeter City manager. It could well be my last game but maybe not. All I know is that I've got one more game this season and I'm trying to win it."